Somehow over the years I had gotten away from SWLing. However, with the resurgence of interest in regenerative receivers in the QRP Community, my interest was peaked once again. I had some free time one weekend and decided to try my hand at building one from scratch. Armed with an article by Paul Harden in QRPp, I raided my junk box and found that I had just about everything I needed to build one. Also, I decided that this would be a good project to build using Manhattan-style techiques I had been reading about. 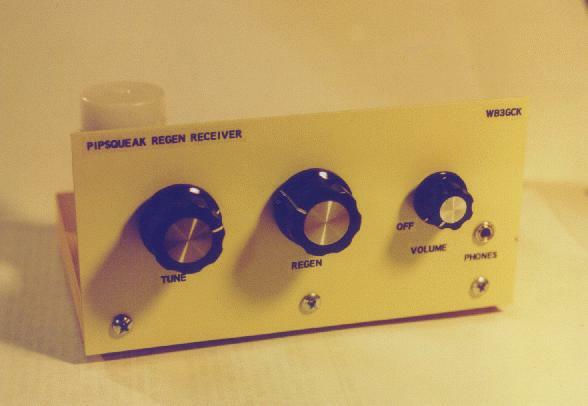 The receiver I built was the "Pipsqueak." This little gem is based on an earlier regen design by Charles Kitchen with an improved audio section designed by Paul Harden. This little receiver is almost as simple as they get. After a few hours of melting solder, I actually had a working receiver. The only problem I encountered was some oscillation when the volume was cranked all the way up. This was quickly resolved by added a .01 ufd capacitor across the output of the audio amp. Now it's rock-solid. I mounted the circuit board on a small piece of pine and used a piece of copper-clad circuit board material for the front panel. The coil in the tuning section is wound with #22 hookup wire on a plastic 35mm film container. I also did a little fiddling with the tuning section to get the band coverage I was interested in. I wound up putting a .001 ufd cap in series with the 140 pF poly variable tuning cap. It tunes from 4.9 - 10.3 MHz, covering 2 or 3 of the more popular shortwave broadcast bands. The performance is surprisingly good for such a simple receiver. With a 20-foot wire antenna strung through the ceiling joists of my basement shack, I'm able to pull in the major shortwave stations with plenty of volume in the headphones. Although I no longer chase QSL cards from the stations I hear, I still like to fire up this little radio and listen to the news from BBC. 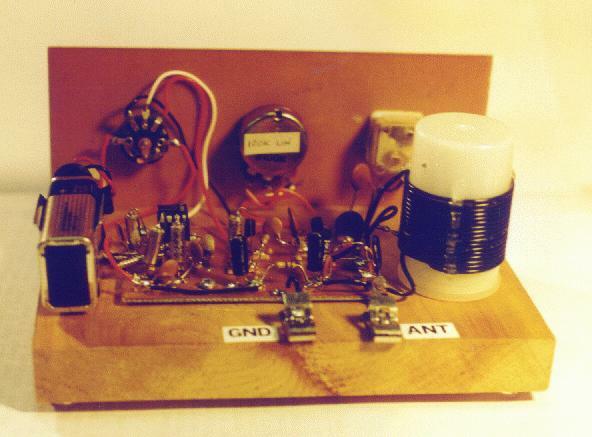 What makes it even better is knowing that I'm listening to it on a radio I built from scratch.